BCA (Bachelor of Computer Applications) is a 3-year graduate degree course that deals in basics of computer applications. The course eligibility is 10+2 from a recognized board with minimum aggregate marks as per the institutes’ requirement. Average course fee charged by institutes ranges from INR 1.5 to 6 Lacs. The fee might differ for different institutes. The course focuses on enabling students to have a basic knowledge related to various aspects of computer applications and working of IT industry. BCA course aims at enabling students to have an entry-level knowledge of computer science and its various applications both practically and theoretically. BCA course graduates have a variety of career options after completion of the course. Apart from pursuing higher study course such as MCA or any related course, students can secure a job in diverse areas such as software development, banks, ITES, government departments, Education, etc. Eligibility Qualifying 10+2 or equivalent examination with 45% marks and above in any relevant stream with English as a subject of study from a recognized university. 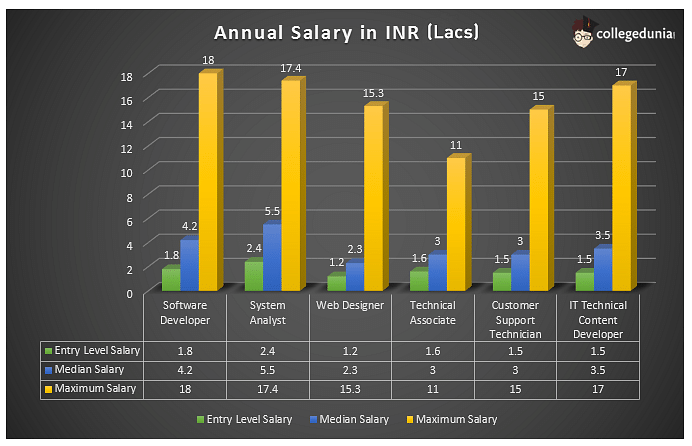 Top Recruiting Companies Wipro, Infosys, NIIT, HCL, TCS, etc. Job Positions Programmer, System Analyst, Network Designer, System Manager, etc. BCA Course: What is it About? BCA Course is a study of computer science and its related applications. It is said to be one of the most sought-after courses for students who wish to make a career in the IT field. The course enables students for roles pertaining to Computer Applications and IT industry and helps a student develop programming skills, networking skills and learn application packages, programming languages and modern techniques of Information Technology. BCA Course is specially designed to prepare students for the IT field and also build a basic foundation for higher studies. Basics of Programming, Networking, World Wide Web, Data Structure, Advanced basics of programming, database management, mathematics and software engineering are some of the topics that are covered in BCA course. There are many institutes that provide BCA course. It is crucial for a student to secure admission to institute that offers them extensive knowledge and better placement opportunities. Admission to BCA course can be secured through an entrance exam or on merit basis. Aspirants need to fulfil the eligibility criteria primarily to be able to sit for entrance exam of any institute. Often, there is an entrance exam conducted by a particular university such as IPU-CET, SET. The application process for BCA course entrance commences from the month of May and June. You can apply in both offline and online mode of the application process. The difficulty level is moderate and the questions are of 10+2 level. These subjects of study are explained in detail in BCA Syllabus. There are more sub-parts to a particular subject of study. There are variety of career options that are available for a BCA graduate in IT industry. BCA degree holder can work in several sectors, some of which include Education, Multimedia, Financial Institutes, Government Departments, Security and Surveillance etc. Candidates who don’t wish to go for a job after graduation, can also opt for higher studies like MCA degree i.e. Master of Computer Application. Another good option is Master’s Degree in Computer Management (MCM) or Master’s Degree in Information Management (MIM). For students inclined more towards the managerial aspects of an organization, MBA in Information Technology from a reputed B-School in India is a good option. After completion of BCA course degree, there are several options available for students in India. After BCA, candidates have an obvious choice of an MCA degree which is a postgraduate degree in Computer Applications. MCA is available at all top universities including JNU Delhi, University of Delhi and University of Hyderabad. Another good option is Master’s Degree in Computer Management (MCM) or Master’s Degree in Information Management (MIM). For students inclined more towards the managerial aspects of an organization, MBA in Information Technology from a reputed B-School in India is a good option. Hi Tahar, kindly contact the college you want to take admission in regarding the scholarship policy if any.